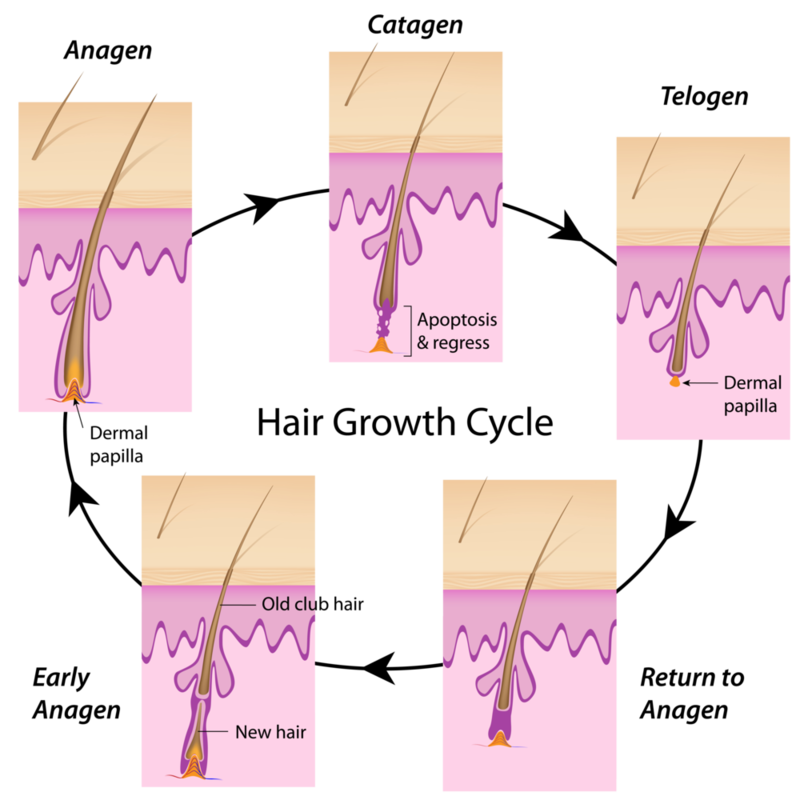 Hair follicles are constantly cycling through various phases characterized by periods of growth (anagen), transition (catagen), and rest (telogen). Individual follicles cycle independently, and this usually prevents shedding of the hair all at one time. Anagen – Typically about 90 percent of scalp hair follicles are in a period of growth known as anagen. The length of the anagen phase varies depending on body location. Eyebrow and eyelash hair has a relatively short anagen phase of approximately two to three months, so these hairs remain shorter compared to other parts of the body. Scalp hair follicles remain in anagen for two to six years, and this is the reason we need to get periodic trims or haircuts. The percentage of anagen hairs decreases as we age and in response to certain hormones. Platelet rich plasma therapy performed by your Houston board-certified dermatologists is thought to cause more hairs to enter into anagen, thereby increasing hair density. Catagen – Catagen is a transition period, and scalp hair follicles usually spend only approximately three weeks in this phase. At any given time, less than 1 percent of hair follicles on the scalp are in catagen. Telogen – The telogen phase is a resting phase that follows catagen. Typically this phase lasts for two to three months on the scalp, and approximately 10 percent of scalp hair follicles are in telogen. Telogen hairs are also known as "club hairs" because of the club-shaped end at the root, and these are hairs are ready for shedding from the base of the hair follicle. It is normal to shed between 50 and 100 telogen hairs per day. However, if this phase is prolonged as in telogen effluvium, the hairs do not return to anagen quickly, resulting in a reduction in hair density.